How is it Friday already? And also, why did Friday take so long to get here? It's been one of those weeks where time seemed to simultaneously fly by and slow down. I did manage to notice in the midst of it all that the trees have begun to take on that sort of peach-fuzz stage of green that they get in the spring. I feel like that is something I don't often take the time to notice. The branches that have been bare and gloomy looking all winter begin to look soft and just slightly green. The same way a peach is fuzzy and you can only just see the little hairs covering it's delicate skin. Even more wonderful than the soft green in the trees is that the same thing is happening to the foothills here in Colorado. From what I hear, this can be a short-lived sight so I'm going to soak it all in as much as I can. Another part of spring and early summer that can easily pass by without proper appreciation is cherry season. How anyone could miss these beauties is beyond me, but I'm sure it happens. Soon enough, food blogs will be lighting up with cherry recipes, like cherry clafoutis, giving plenty of inspiration for ways to use these ruby red treats. My favorite way to enjoy their sweet, juicy flavor is to put them in a big, lovely bowl and eat them just as they are. Perfect. Still, it's fun to mix things up and I think this cocktail is a wonderful way to try something new. 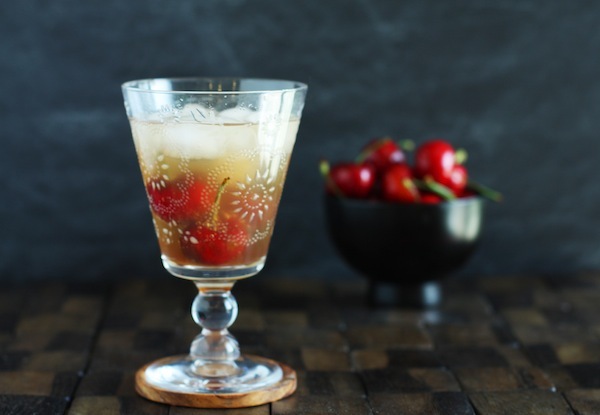 Light and bubbly with the perfect combination of cherry and vanilla flavors, this saké based cocktail is sure to please. I actually pitted a few cherries and pressed them through a strainer to get my cherry juice for the cocktail pictured above, but a better way is to buy a small bottle of pure cherry juice (you can find it at most grocery stores- look for the unsweetened kind) using the garnish to showcase the fresh fruit. If you don't have any saké on hand, you can use vodka instead. Take a moment to enjoy spring, green leaves, and cherries! Cheers! In a cocktail shaker filled with ice, combine the cherry juice, saké and vanilla extract. Shake for about 30 seconds until thoroughly chilled. Pour into a cocktail glass filled with ice and top with club soda. Stir gently to combine. Enjoy!